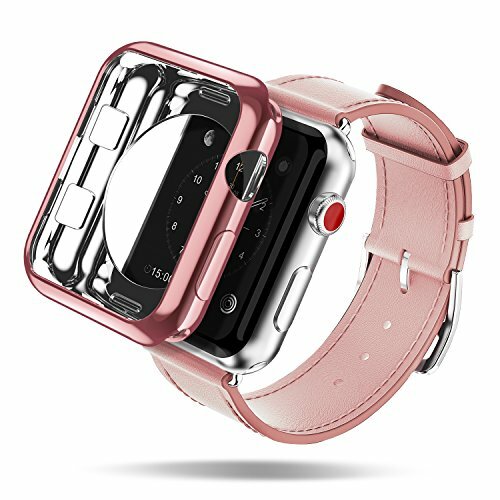 - This Case perfectly fits your Apple Watch with precision cutouts for all buttons and ports and will not be obstacle to charging. - Colorize your watch, Draw the eye, Make your watch more Attractive. - Economic. By one Colored Electroplate case and Get one transparent TPU case Free. - Using environmentally friendly material, Soft and Thin, absorb / relieve the shock, Slip resistant and never scratch your watch. - Work easily to install and remove, You can replace belt without removing the case. - Edge of the case is 0.2MM higher than the screen, Well protecht Apple Watch against scratches. Buy One and Get One Free, One Colored electroplate case and One Free transparent TPU Case are packed together. Durable build with a raise of 0.2mm to protect screen, Rugged, Slim and Lightweight design to provide ultimate protection from bumps and scratches for your Apple Watch. Flexible material allows quick and easily to install And remove, No impact on Charging, Replace Belt without removing case. Perfect cut-outs, exquisite craftsmanship and workmanship, easy access to all controls, buttons, sensors and Apple watch features. Cases Only, Apple Watch and Watch Band are not included! If you have any questions about this product by DUX DUCIS, contact us by completing and submitting the form below. If you are looking for a specif part number, please include it with your message.